This has got to be the most simple and delicious breakfast pizza on Earth! 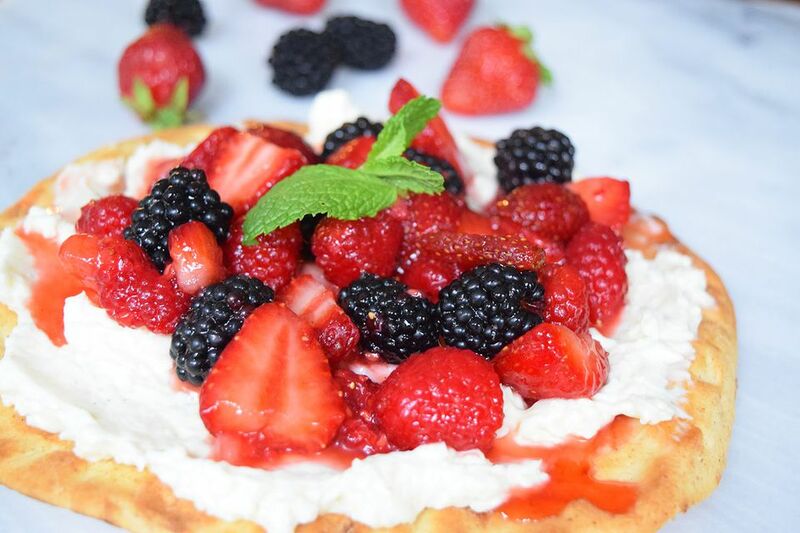 A simple cream cheese mixture, some fresh berries, and a toasted pita come together to form this easy breakfast treat! You can use homemade pizza dough instead of pita, but the pre-made pita makes it so much faster! They look super pretty on a brunch table. If you cut them into slices they are easy to serve to a large group of guests. Or you can make mini versions if you are using fresh pizza dough! I love using vanilla sugar to mix with the berries when I have it on hand. Whenever I use vanilla bean for something, I take the leftover pods and place them in a jar of sugar...voila! vanilla sugar! Of course, you do not have to use vanilla sugar in this recipe. I add a little vanilla extract to the cream cheese mixture and sometimes to the berries too! You can really use any berries you like, but the fresh strawberries, blueberries, blackberries, and raspberries look so pretty together and are typically close in season! Any combination of the berries will do. You can also make a tropical version with kiwi, mangos, and oranges. The cream cheese can also be replaced with ricotta cheese. You can also replace the sugar with honey for a little more natural sweetness. You can make the berry mixture ahead of time and store it in the refrigerator! Brush each pita with the olive oil and place directly on the oven rack. Bake for about 7 minutes, or until lightly brown and toasty. Beat together the cream cheese, vanilla extract, and sugar until smooth. If you make sure the cream cheese is softened it will blend together much easier! Stir together the berries and sugar in a medium sized bowl. Place in the refrigerator if necessary. You may also add lemon juice to the mixture if you like! Take the pita out of the oven and allow it to cool. Place on a cooling rack so that the pita does not get soggy. Spread the cream cheese mixture onto each pita and top with an even portion of the berry mixture! Sprinkle with powdered sugar and garnish with mint if you like!